Ten classic American aircraft from the 1930s through the 1950s will take to the skies in the form of postage when the U.S. Postal Service dedicates the American Advances in Aviation commemorative stamp sheet at EAA AirVenture Oshkosh 2005. The July 29 first-day-of-issue ceremony, hosted by the Experimental Aviation Association, will take place at the event’s Aero Shell Square at 10 a.m., in the shadows of at least six of the rare aircraft depicted on the stamps. Many pilots and crewmembers of these historic aircraft will be on-site to discuss their experiences. An autograph session will follow the event. The stamps will be available at post offices and philatelic centers nationwide Saturday, July 30. 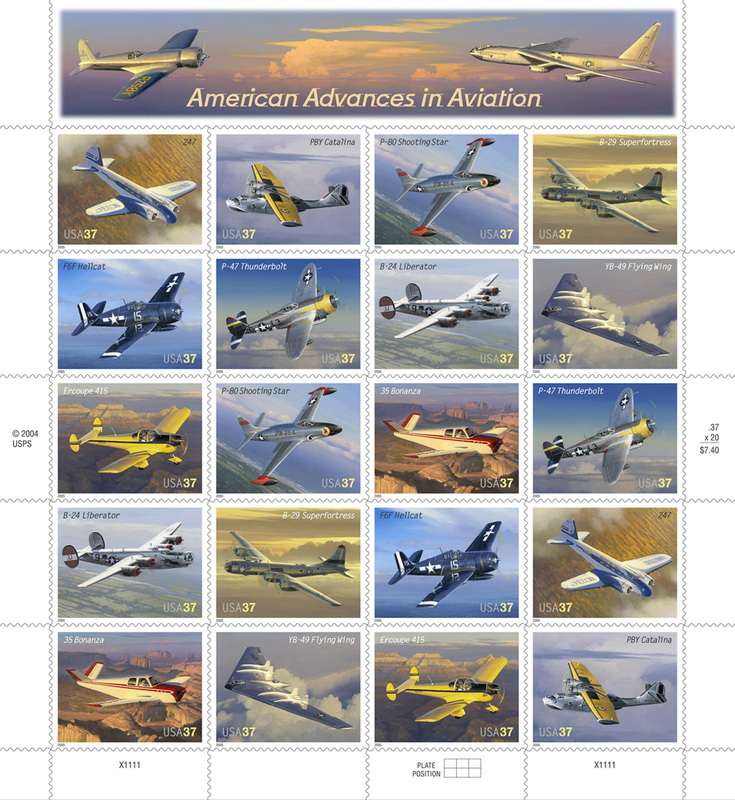 The stamp images depict Boeing’s 247 and B-29 Superfortress; Consolidated’s PBY Catalina and B-24 Liberator; Lockheed’s P-80 Shooting Star; Grumman’s F6F Hellcat; Republic’s P-47 Thunderbolt; Northrop’s YB-49 Flying Wing; Engineering and Research Corporation’s Ercoupe 415; and Beechcraft’s 35 Bonanza. The header illustration includes a Hughes H-1 racer and Boeing’s YB-52 Stratofortress. 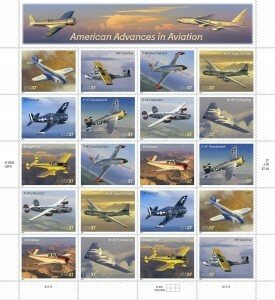 Phil Jordan designed the American Advances in Aviation stamp sheet. William S. Phillips, an award-winning historical aviation and landscape artist who also created the artwork for the 1997 Classic American Aircraft collection, painted the stamp illustrations and header design. Six limited edition prints will only be available at AirVenture. Authenticated with a numbered certificate and autographed by Phillips, high-quality prints (12 3/4 x 13 3/4 inch) of select aircraft stamp images will be available for $175. Each print is mounted with an aircraft stamp postmarked with the Oshkosh, Wis. July 29, 2005 first-day-of-issue cancellation. Prints are available for the 35 Bonanza, B-24 Liberator, F6F Hellcat, P45 Thunderbolt, PBY Catalina and the P80 Shooting Star. A sampling of products will be available on-site and through the Postal Store at www.usps.com shop or at 800-STAMP-24. Advance orders are now being accepted for these products and will be fulfilled following the July 29 issuance of the stamps. Military aircraft scheduled to be on display during the ceremony include the B-24 Liberator, B-29 Superfortress, F6F Hellcat and the P-80 Shooting Star. Civilian aircraft scheduled to appear include the A-35 Bonanza and the Ercoupe-415.